An eight-week-old pit bull puppy has been reunited with his family after being snatched from his 13-year-old owner Saturday afternoon. A man, who found Yeti on his porch Sunday morning, remembered hearing about the stolen puppy on local TV news reports the night before and called the Montgomery County non-emergency line. Officers from the 6th District came by to pick up Yeti and return him to his family. 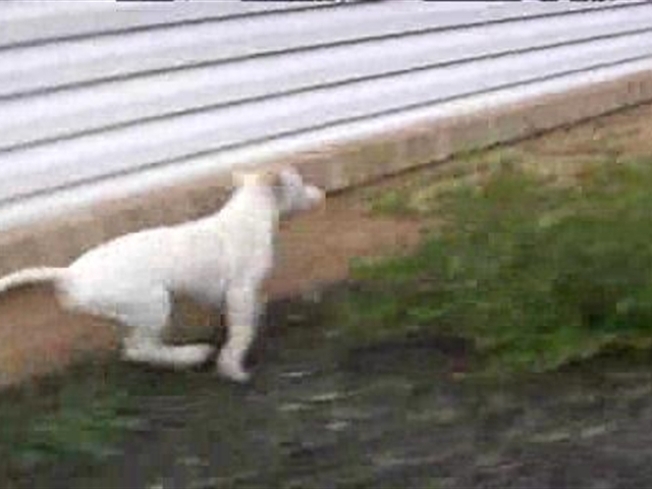 Yeti, a white-colored puppy with a black rectangular mark over one eye, was unharmed. The teenage victim, whose name is not being released because he is a minor, was walking Yeti on Saturday afternoon at approximately 2:10 p.m., in the area of Snouffer School Road and Ridge Heights Drive, when he was approached by two unknown male juvenile suspects who grabbed the puppy and ran. The suspects were last seen on Cochrane Way walking toward Chesley Knoll Drive in Montgomery Village. One suspect is described as a black male, 13 to 16 years old, and 5’6” tall, wearing a red shirt and blue jeans; the other suspect is described as a black male, 10 to 13 years old, and 4’11” to 5’ tall, wearing a black shirt and light-colored shorts. Police are still looking for the suspects. Anyone who has any information about them is asked to call the police non-emergency number at 301-279-8000.